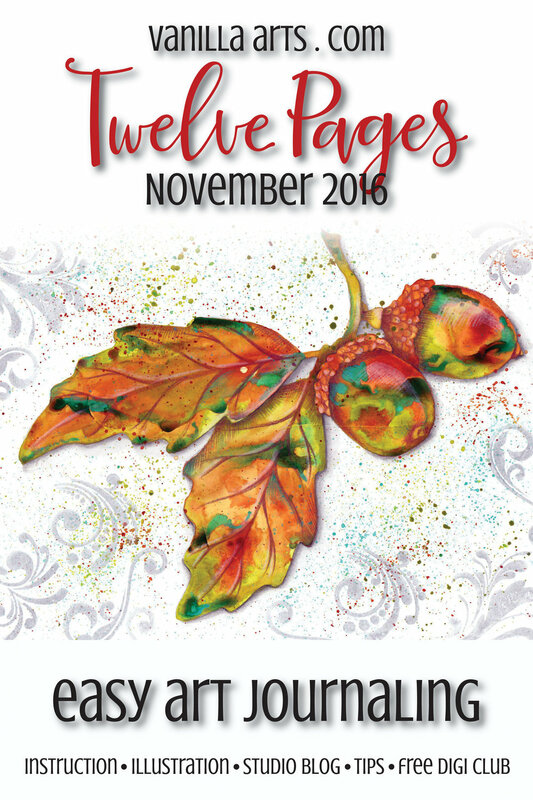 Join us for a Twelve Pages class in November! Twelve Pages is perfect for crafters, cardmakers, stampers, and scrapbookers. If you've thought about dipping your toes into the world of expressive art journaling, this class is perfect for you! Beginner to advanced students welcome. Students work side-by-side with me as we play with color, line, and texture. The lettering and other important details are included in the kit. Every student leaves with a slightly different and wonderfully unique project! Lesson: more color charging, this time we'll use colored pencil to give life to our charged color areas. Class fee includes both instruction and the kit. Students must supply their own paints, brushes, and surface protection. Please see supply list for required materials. RSVP for your seat ASAP! Join me in October for a Twelve Pages class! Here's a little taste of fall to get you into the mood for chilly nights, football, and trying to decide if there are enough leaves down to make it worth raking. Yes, I have a 60 year old Box Elder tree which is already shedding golden yellow teardrops onto my front lawn. It's officially fall in my small corner of Michigan. This is a closeup of my latest art journaling kit in the 12 Pages class series. No drawing skills necessary to take this class, just sit back and enjoy playing with color. Make some time for craftiness this weekend! The world always feels a little better and looks a little brighter when you can color and paint.